Administrators can now set up a reminder to be sent to an athlete on a recurring basis. It was designed to ensure an athlete would be sent reminders to enter in new data (not data which is already scheduled) on specific days of the week. The Daily Reminders Module is available on the Administration Site. Click "Daily Reminders" to open the Module and create a new reminder. 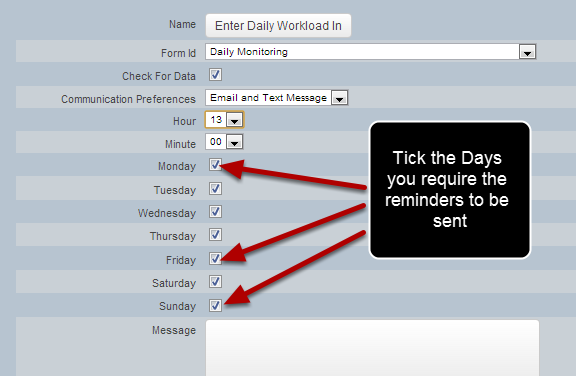 The Daily Reminders Module enables an Administrator to set up a recurring e-mail or text to be sent to an athlete on a specific day of the week at a specific time. All of the reminders that you have created appear in a list on the left. To create a new reminder click on the "Create New Daily Reminder"
To set up a new reminder click on "Create new Daily Reminder" and follow steps #1 to #10 below. Enter in the Name of the Reminder. The example here shows this reminder being names "Enter Daily Workload Information"
Please enter in an appropriate name as this will be sent to the athlete in the e-mail header. It is also the name that appears for this reminder in the Daily Reminders List (as shown in the image in the step above). Click on the Form Id drop down and then select which form you want the reminder to be linked with. 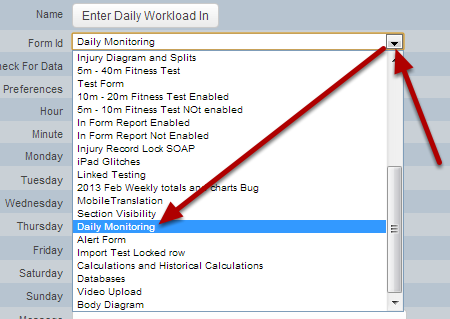 The example here shows the Daily Monitoring Form being selected. #3: Choose whether you want the reminder to be sent depending on whether or not the athlete has already entered in data for that day. 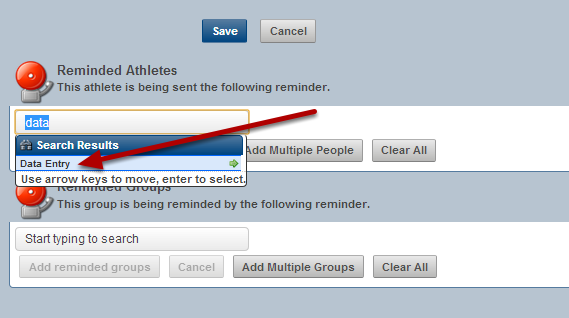 -If you ONLY want the reminder to be sent out IF the athlete has NOT entered in any data on the day the reminder is sent, then make sure the "Check For Data" button is ticked (as shown here). This means, if you set up the reminder to be sent at 9:00pm at night and an athlete has already entered in their daily monitoring data for that day, the reminder will NOT be sent. -If you want the reminder to ALWAYS be sent out on a specific date and time, regardless of whether or not the athlete has entered in their data on that day, then untick the "Check For Data" button. This means the reminder will always be sent out at that time. -Internal Only: will be sent to the athlete's inbox on the internal mail messaging feature in the system. -Email: will be sent to the external email address listed for the athlete in their account details. -Email and Text Message: will be sent to BOTH the athlete's e-mail address and via SMS to the cell phone number listed in their account. Set the Hour (24 hour selection) and the Minute (15 minute blocks available) that you require. The Hour selection is based on a 24 hour clock so PLEASE double check that you have chosen the correct time for the reminder to be sent. Athlete's won't be happy if you send them text messages at 1:00am in the morning because you accidentally chose 1:00 and not 13:00 (1:00pm). 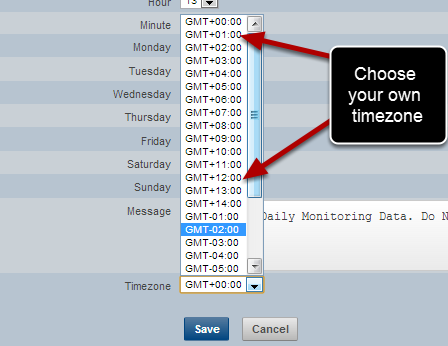 Choose the time that you want the system to check whether any data has been entered and to send out the alerts. For Monitoring Daily workload you would most likely select that the athlete is reminded on every day of the week (as chosen here). For Monitoring a workload form that is tracked weekly you would select the day that you require the athletes to complete it on, e.g on a Sunday to complete the data from the previous week. Tick any days that you want a reminder to be sent on and the reminders will be sent based on the days that you have ticked. Untick any days that you do NOT want a reminder to be sent on. Write in the message that you would like to be sent to the athlete. Again, be very careful about the content of the message; be succinct and to the point. If you chose to send a Text Message, ONLY the content written in the messages section will appear in the Text SMS (the Name in step #1 is NOT used). Consider adding in "Do Not Reply" to the message so that the athletes do not try and text the system back! Consider adding in "Do Not Reply" to the message so they do not try and reply to the e-mail. e.g. Queensland Australia would be GMT + 10:00, New Zealand would be GMT + 12:00, UK is GMT + 1:00. N.B. If your country or area has day light savings, this cannot be taken into account and it will ONLY send based on the Timezone selected. If your athletes are traveling overseas and you want to track them, it would be important to set up a new reminder for the new timezone and to remove them from their usual reminder. Type in the name of the athlete into the text search box, click on their name. Then click on the "Add reminded athletes" to add them to the list. You can also click on "Add Multiple People". Once the pop up box appears with the names of the athletes, make sure a tick is placed beside the athletes that you want to add to the reminder list. All of the users in the system will appear for selection, so it could be a very long list to go through depending on the size of your system. 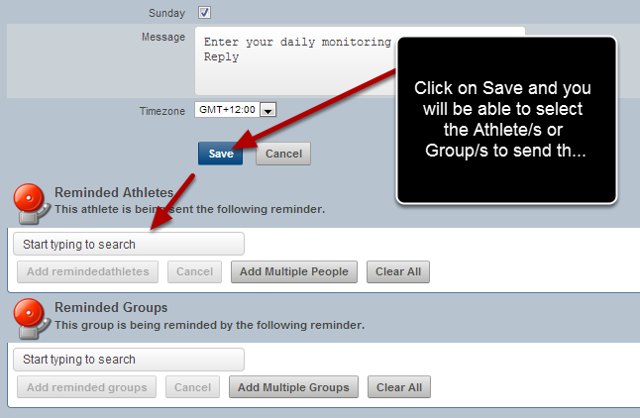 Enables you to send reminders to all of the athletes in a group. Select one group at a time by typing in the search text box. Click on the Group Name. Then click on "Add reminded groups". You can also click on "Add Multiple Groups". Once the pop up box appears with the names of the groups, make sure a tick is placed beside the groups that you want to add to the reminder list. All of the groups that are set up in the system will appear for potential selection. 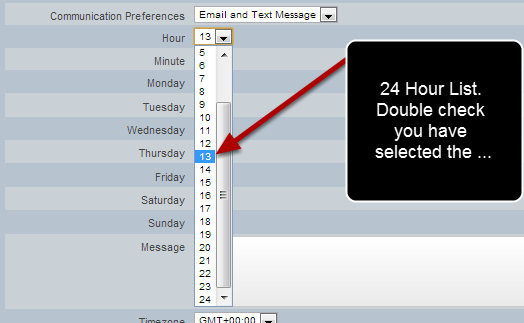 To see examples of how the Daily Reminders appear in an e-mail message or via text see the next lesson. N.B. once you have created your reminder, TEST it on yourself, or follow up with the athletes to double check that you have set it up correctly and that the athletes received it. As with any of the reminders or alerts that can be set up, it always pays to test out the alert on yourself first (e.g. set up the reminder for your account before you apply it to the athletes). Once you set it up for the correct athletes/groups it would pay to follow up with these users to check that they received the reminder, through the correct e-mail or cell phone numbers.